Rally in the Bowl video excerpts and commentary. In Case you missed the rally in the bowl, here is what our executive had to say there. Hello, I am Ken Glover, a University employee since 1992, 7 year ASPA volunteer, a past ASPA president, and co-lead negotiator for the ASPA bargaining team. As an ASPA executive member, I had the privilege of sitting with people when they were laid off a few years ago. From my own experience and those of the other ASPA volunteers, I heard how a number of people were first concerned about the students they work with, their co-workers, and the programs they were being forced to leave behind. “What will happen to them?” was almost always asked. Right now, there are a lot of dedicated and passionate people working at the university doing jobs they believe in and take ownership for the outcomes of. The direction the senior leadership at this institution has been taking is to take advantage of those people by heaping upon them increased workloads, less thanks, and less acknowledgement. At the bargaining table we are told that our members stay too long in their jobs (like that is a bad thing), that staff turnover is too low (when most companies are striving for a low staff turnover), and then using those as reasons to claw back benefits and offer no wage increases for 2 years of a 4 year agreement. We were also told that the university has money, but not for ASPA members. Most employees don’t get to personally experience this kind of truth about how we are thought of by the “leadership” of this institution. As ASPA President, I got to learn a lot about how senior leadership thinks about the employees, and in bargaining we get a lot more of that kind of abusive relationship building. When the ASPA bargaining team suggested interest based bargaining, where we can talk about the challenges we face together, and come up with some creative ways to address those challenges, the University’s team accused us of using this style of bargaining as a way not change anything and came back with their positional agenda and bullying attitude. I have heard that our new University President, Peter Stoicheff, is a man who walks the talk. When he says he wants to build relationships and have an engaged and enthusiastic workforce, he means it. I would like to invite President Stoicheff to charge his bargaining team to live his vision and come back to the table to negotiate with mutual respect for all the employees on campus. The story about our rally starts at 6 minutes into the clip. We want to thank you all very much for taking the time to attend one of the information sessions, reading updates and providing feedback over the last few weeks; the input and guidance you provided the bargaining team was invaluable. You spoke loud and clear with only 9% of attendees at the information sessions showing any support for the current University offer. Throughout your comments there was a common thread about feeling disrespected by the employer and with your continued support we want to change that. 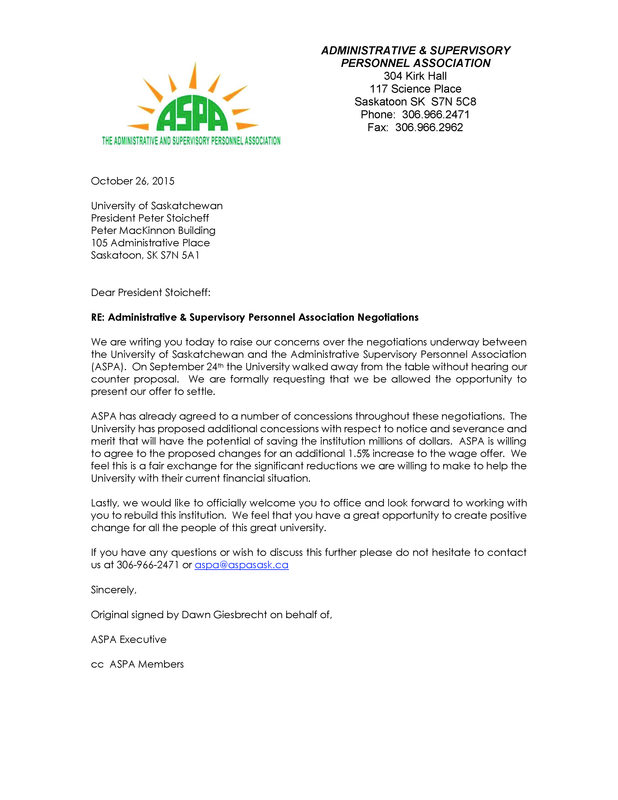 Many members also wanted to know what the other bargaining units thought of the offer presented to ASPA. 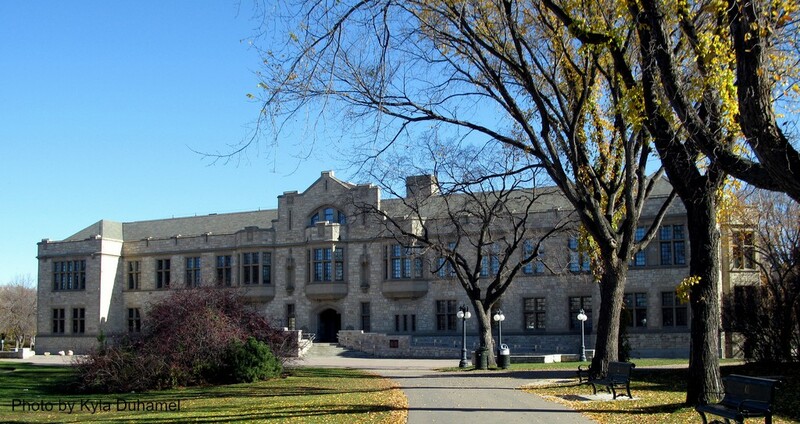 We consulted almost every single bargaining unit on campus very recently. The other unions clearly saw the disrespect shining through the offer as well and are ready to show their support for our members. So united we will stand alongside our colleagues from the other bargaining units on campus. On Monday October 26th at noon we will be holding a public rally in the bowl to welcome the new President and to ask him to send his team back to the table to negotiate with the respect and dignity we deserve. The other bargaining units will be joining and voicing their support in front of the entire campus community and local media. We hope that this rally will bring positive change to the practices of our Human Resource department on campus under the new leadership of President Stoicheff. We need you to come out to the bowl and bring your colleagues, whether they are ASPA, USFA, CUPE, PSAC or PAIRS and lets send a positive message of change and respect together. We heard you loud and clear and this is your opportunity to make sure the employer hears you too. 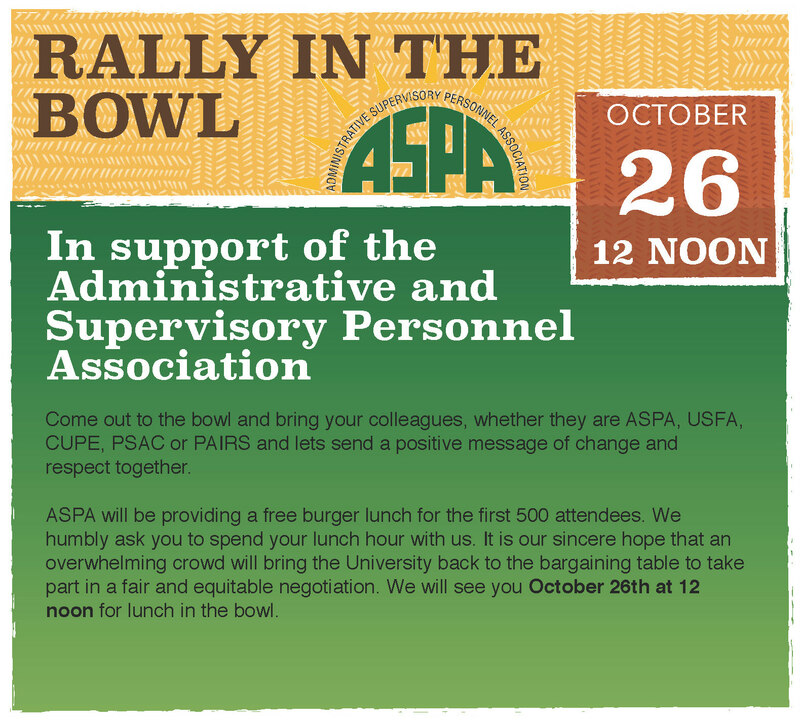 ASPA will be providing a free burger lunch for the first 500 attendees. We humbly ask you to spend your lunch hour with us. It is our sincere hope that an overwhelming crowd will bring the University back to the bargaining table not to dictate terms as they have, but rather to take part in a fair and equitable negotiation. We will see you October 26th at 12 noon for lunch in the bowl.